This tutorial series will focus on the HP Prime’s Geometry App. Most of the time we will focus on the Plot screen. The software version that we are working with is Build 8151 (6/17/2015). 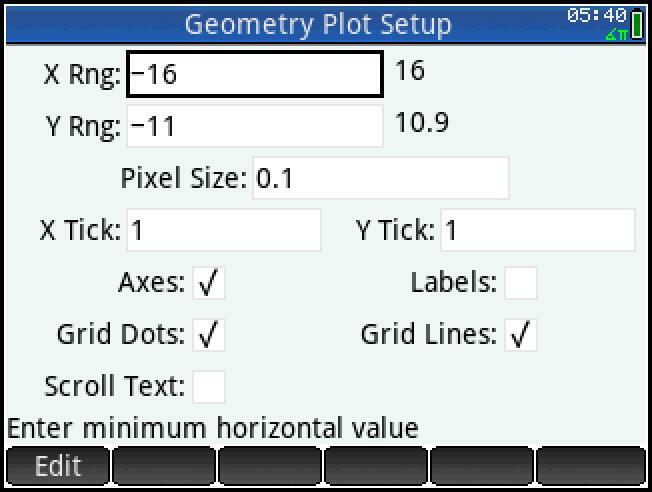 For the tutorial, I am going to set the plot screen with the following parameters: XRange = [-16, 16], YRange = [-11, 10.9], and the ticks for both axes are 1. 1. Press [ Shift ], [ Plot ] (Plot Setup). 2. Set up the parameters as shown below. Note that the Xmax and Ymax are automatically set. I also recommend that you set the calculator to Degrees mode through the Settings Menu. 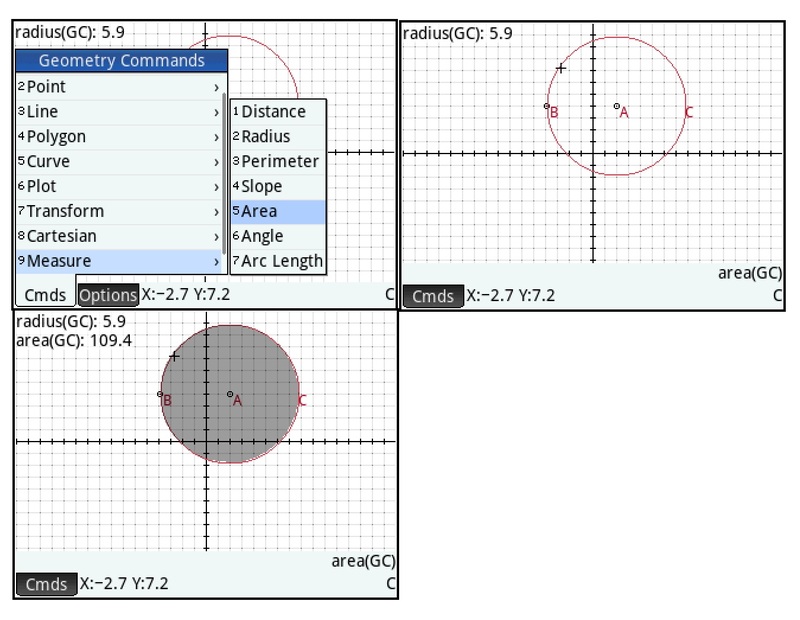 For this lesson, we are going to draw a circle, draw its radius, find its circumference, and its area. 1. Press [ Plot ] to go the plot screen. If necessary, clear the workspace by pressing [ Shift ], [ Esc ] (Clear). 2. Press the soft menu key (Cmds), select 5 for Curve, 1 for Circle. You are prompted to determine where the center of the circle. 3. For this lesson, just move the cursor, or click on/touch the screen anywhere you like. Press [ Enter ] to anchor the circle’s center. 4. Select a point to determine who far the circle expands. Pressing [ Enter ] will draw the circle, and plot the point you selected on the circle’s edge. Note how everything is labeled. A is the center, B is the outer point, and C is the circle. 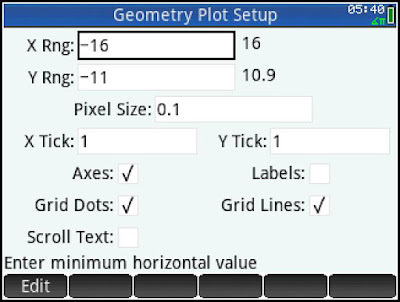 If you were to refer to these objects outside of the plot screen (like the Num screen or the CAS Home screen), you will need to have a G (capital “G”) suffix attached, like this: GA, GB, GC. 1. 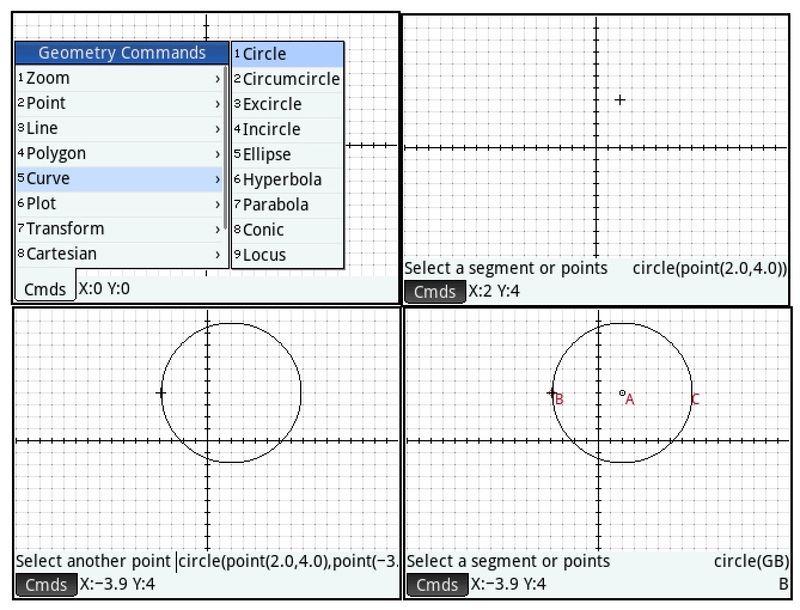 Go to the center of the circle (point A). You can scroll your cursor by using the arrow keys or touch on/click on the screen. As of the current version (8151), there is no “Go To” feature (hopefully on a future update). 2. Press (Cmds), 3 for Line, 1 for Segment. Select the center by pressing [ Enter ]. 3. Select any of the circle’s edge and press [ Enter ]. The radius, represented by the line segment is drawn. 1. Press (Cmds), 9 for Measurement, 2 for Radius. 2. Select the circle. When the circle is selected when it turns red. Press [ Enter ]. 3. The result will be on top of the Plot screen. 1. Press (Cmds), 9 for Measurement, 5 for Area. 2. Like the last exercise, select the circle. Again, you know if the circle is selected (by the cursor’s placement) if the circle is red. Press [ Enter ]. 3. The circle will filled with color and the result will be on top of the Plot screen. 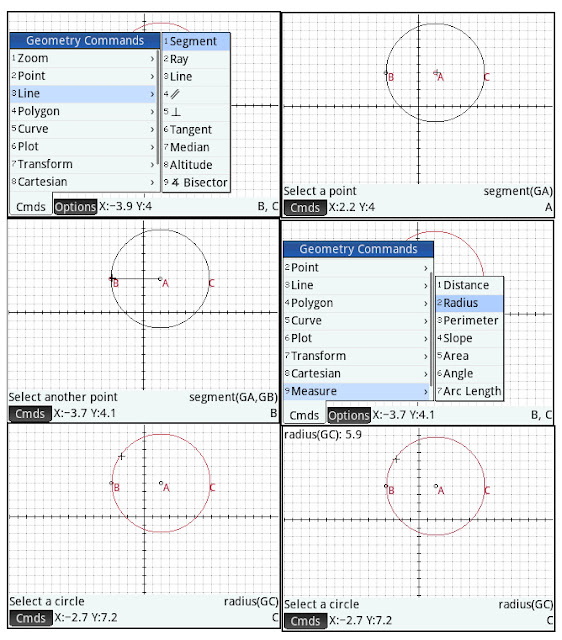 That is going to wrap up Part 1 of the HP Prime Geometry App Tutorial. In Part 2, we’ll be working with Triangles, finding angles, re-sizing, and reflecting triangles. Until then, have a great day! What a great machine. I wish all my math prep students had one (only one does...an extra one I gave him).